2014 is the 20th anniversary of the Thames Landscape Strategy (TLS). To celebrate the 20th anniversary a series of events and projects are planned across the TLS region. 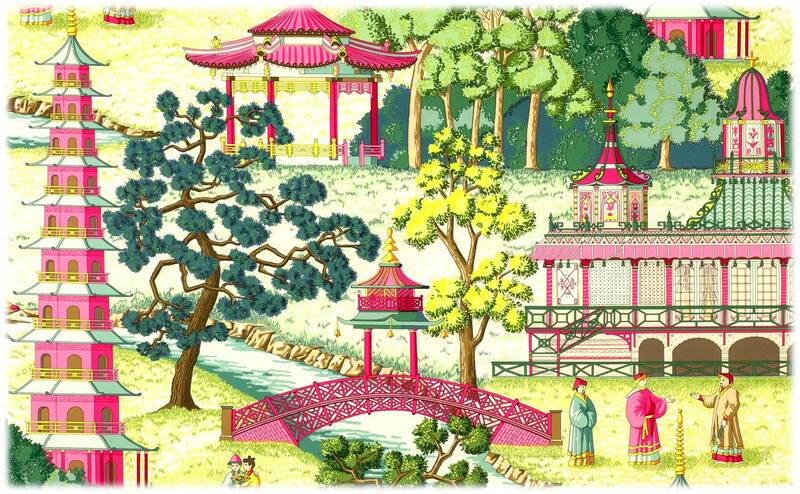 The centrepiece of these celebrations will be the re-creation of an Eighteenth century Chinese tea tent with an integral camera obscura that can be used as an educational tool to increase understanding about the remarkable Arcadian landscape. These ‘obscura tents’ were once a common feature along the Thames providing a magical way for everyone to interpret the environment around them. 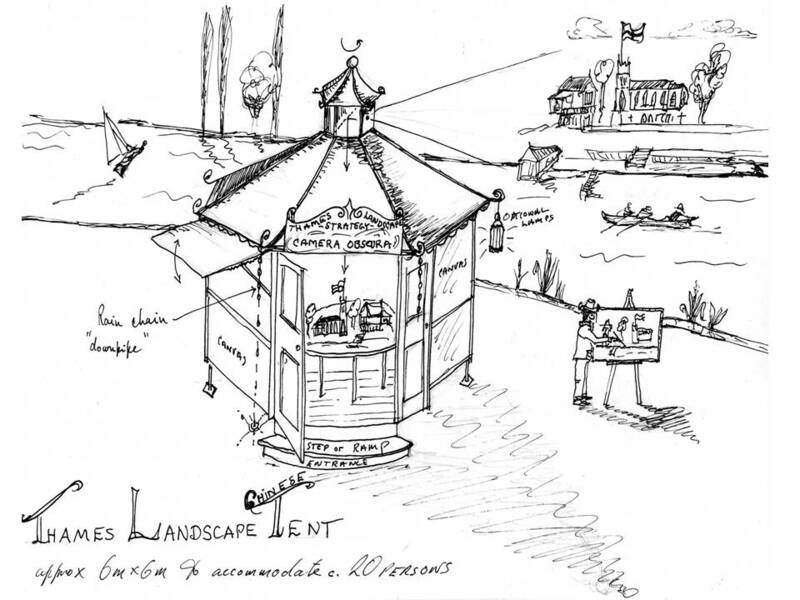 It is proposed to commission Mark Edwards MBE (Richmond Bridge Boathouses) to design and construct a modern and portable interpretation of a Tea Tent that incorporates a camera obscura at its top – reflecting an image of the surrounding landscape downwards to a table at the centre of the tent. This can be used at local fairs, educational days and special events. 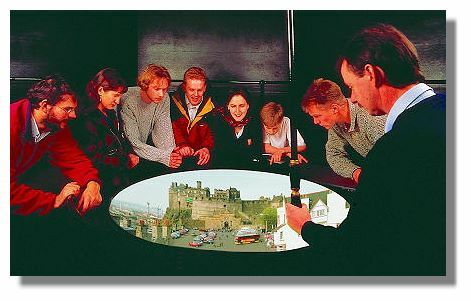 A Camera Obscura, derives from the Latin word camera meaning “room” and Obscura meaning “dark” or translated as “dark room”. It is a term first used by the German astronomer Johannes Kepler in the early 17th century. The affect produced by a Camera Obscura is based on elementary physics. By making a small hole in the wall of a darkened room an inverted image of the scene outside the hole can be produced on the inside of the room. This is due to the fact that light travels in a straight line and when some of the rays reflected from a bright subject pass through a small hole in thin material they do not scatter but cross and reform as an upside down image on a flat surface held parallel to the hole. The physics of pinhole reflection of the outside world from a darkened room dates back to the Chinese philosopher Mo-Ti in the 5th century BC. Mo-Ti called this darkened room a “collecting place” or the “locked treasure room.” It was first described outside China by the Arabian scholar, Alhazen ,of Basra in about 1030. Then Leonardo DaVinci more famously documented it in 1490 in his notebooks. Others like Dutch scientist Reinerus Gemma-Frisius used a camera obscura in 1544 for observing a solar eclipse. In 1558 Giovanni Battista Della Porta in his book Magiae Naturalis recommended the use of this device as a drawing aid for artists. 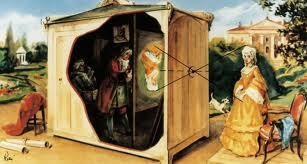 Many of the first camera obscura’s were large rooms and then compact boxes. Later in the 16th century the box camera obscura’s were improved with the addition of a convex lens into the aperture, which provided for better image quality. In the eighteenth century the addition of a mirror was used to reflect the image down onto a viewing surface. This allowed for portable ‘tents’ often associated with tea drinking to be constructed that formed a movable inside place from which to view the outside world. These obscura tents quickly became a marvel of the Scientific Age, a tool for the most fashionable gentlemen of the day to show off their good taste and knowledge. It is known that camera obscuras were a feature of Georgian Richmond – obscura tea tents being erected in the gardens of riverside villas to be used by the gentleman as a tool to interpret the landscape around them. 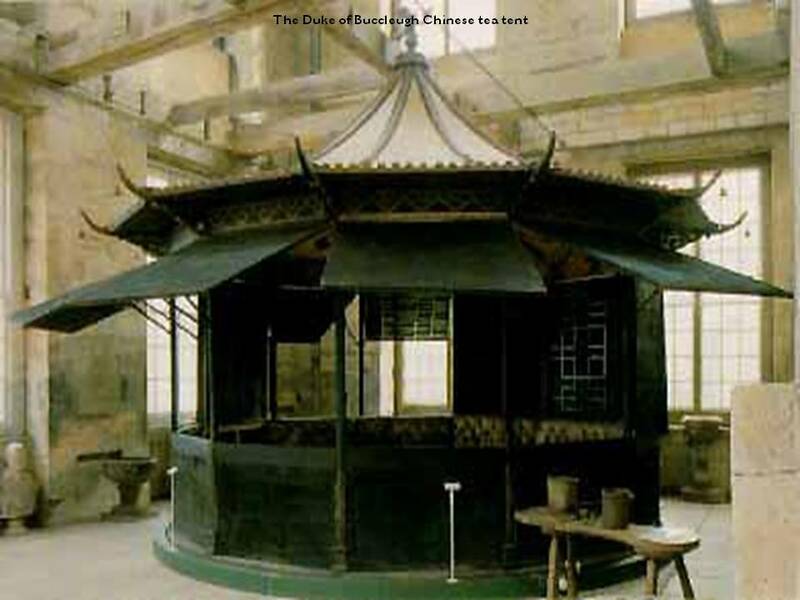 One C18th tea tent survives – the Duke of Buccleugh Chinese Tent, now kept at Boughton Hall in Northamptonshire. The scientific age coincided with the great period of C18th Arcadian enlightenment based at the Royal palaces and aristocratic villas of the Arcadian Thames. During this time the landscape structure we cherish today was laid out along the Thames whilst the ideas that were shaped and forged on and below Richmond Hill would lead to the formation of the English Landscape Movement (recognised as one of England’s most important contributions to world culture). It is this period more than any that encapsulates the essence of the Arcadian Thames and subsequently it is the C18th that is used by the TLS as a tool to educate the public about the landscape that stretches between Hampton and Kew today. The Thames Landscape Strategy has an active education and outreach programme that has been delivered in partnership with a range of partners including Orleans House Gallery based at Twickenham and the Jubilant Trust in Richmond. It has been a long standing aim of the TLS to build a camera obscura as a tool to increase understanding about the Arcadian Thames. 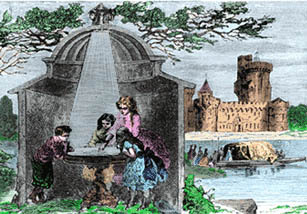 It is intended that a portable camera obscura would form the centrepiece of future TLS educational activities to be used at organised educational days, special events and at fairs across the region. The obscura would be used for many years to come (one or two eighteenth century tents still survive) and it is hoped that the structure would become a cultural icon in the same way that the replica eighteenth century boats such as the Gloriana and Jubilant have captured the public imagination. It is proposed to design and build a replica of an eighteenth century Chinese Tea Tent (based on the Duke of Buccleugh’s Tea Tent that survives at Boughton Hall in Northamptonshire) that would house a camera obscura at its top. The Arcadian Thames Camera Obscura tent would be constructed in a traditional way although designed with a modern twist in order to allow it to be easily erected and robust enough to meet modern health and safety considerations. 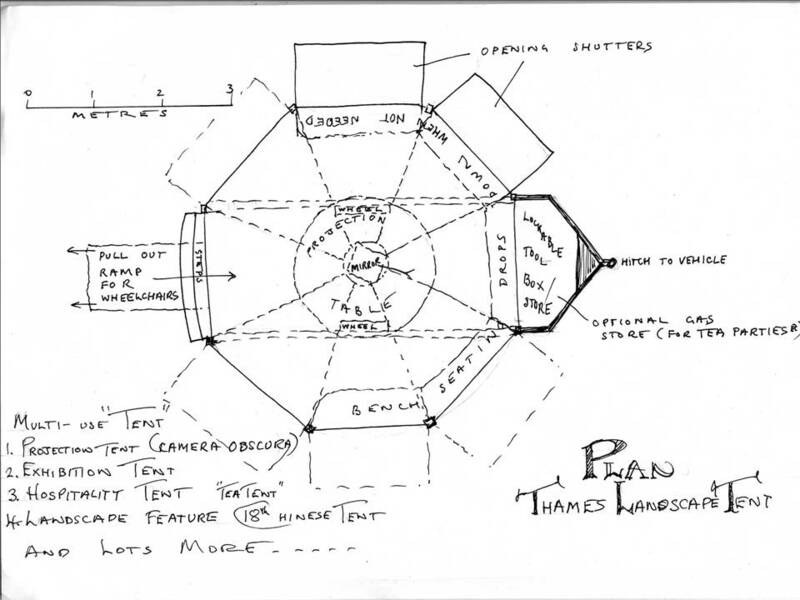 The TLS has teamed up with HM The Queen’s Royal Thames Barge maker Mark Edwards, based at Richmond Bridge Boathouses to design and construct the tent and the camera obscura. 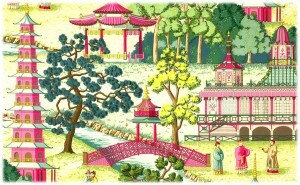 The tent would be designed in the correct style for the period – following the Chinese tradition. The modern twist is that the structure is based on a box trailer design with 4 corner uprights extending to 2m to the eaves then welded ridge bars to the camera apex. Four additional uprights hinge and extend out from the basic welded steel structure. The steel would be finished in wood and painted to form an invisible structure. The main frame is floored in wood (raised off the ground) with side flaps which hinge down to form an octagonal shape. Once the floor and frame is extended, a central round table is positioned to allow the rotating camera cupula to be erected. Next, a ‘bell tent’ cover is thrown over the structure and the side panels pinned and hinged in place. The upper half of the canvas walls can be opened if needed. The outside of the tent would be traditional white canvas draped across the steel frame. It would have a single double wooden doorway, clad in canvas. The end of the eave pole and to the frame would have curved wrought iron finals depicting dragons – similar to those found on the traditional Thames barges. A retractable ramp would be incorporated into the trailer to allow for full disabled access. The inside of the tent would need to be dark in order for the image reflected by the camera to be viewed. To achieve this it is proposed for a series of images to be painted on the inside of the canvas depicting dragons flying on the ceiling and local scenes found along the Arcadian Thames on the walls. It is proposed that some of the panels could be painted by local artists and local school children in partnership with Orleans House Gallery. The camera obscura would be placed in the cupula above the centre of the tent (similar to an old music box – see front the first page of this proposal). The image would be reflected downwards to a central table facing upwards that allows for visitors to easily view the world around them. The scene displayed can be changed by rotating the camera using a long pole descending into the tent from above. The tent would fit approximately 20 people at any time. A series of drop down wooden benches can be used. The external draw bar will be modified to have a waterproof box containing a gas storage bottle. This would provide power for lighting and a small water heating system. Guests could take tea in this way from replica C18th Chinese tea bowls. Chinese lanterns would hang on the exterior. The TLS would own and store the tent and camera obscura at their offices at Holly Lodge in Richmond Park. It would be used as part of the on-going TLS education and outreach programme and could be hired out for private events in order to provide an income that would help to sustain the education programme in the longer term. It is proposed to train a small team of dedicated volunteers to erect and operate the tent and obscura. The TLS has an excellent track record in managing volunteers – carrying out 210,000 hours of volunteer work over the past decade. All costs associated with the movement and erection of the tent at events or educational days would be met through existing and future TLS educational budgets. It is anticipated that some maintenance work would be needed in the future – up to £2k once every five years. . This would be met by funds accumulated from the renting out of the tent and obscura for private functions. An appeal to raise £30,000 to fund the construction of the Arcadian Thames Camera Obscura was launched at the 31st March at Hampton Court Palace by HRH The Duke of Gloucester during the Thames Landscape Strategy’s 20th Anniversary Arcadian Thames event. The Father Thames Trust (the charitable arm of the Thames Landscape Strategy) has already committed £5,000 towards the project and would be the beneficiary of any further grants or donations. The camera obscura would be constructed over the winter 2014/15 ready for use the following summer season. This enables the FTT to claim as much as 28% extra on your donation at no additional cost to yourself. I would like the Father Thames Trust to treat any donations I make to the FTT in furtherance as Gift Aid until I notify them otherwise. I confirm I pay income tax and or capital gains tax at least equal to the amount the Trust will claim in any one tax year. I am under no obligation to make any further donation and I can cancel this declaration at anytime. Please tick the box below. Please return the gift aid form with your donation to: The Father Thames Trust, c/o 17 Old Palace Lane, Richmond, Surrey, TW9 1PG. The Father Thames Trust is registered with the England and Wales Charity Commission registration number: 1054655 and works with the Thames Landscape Strategy as its charitable arm.